Year One done, Welcome Year Two! First off, I just wanted to say "Hi". Ellen has been putting up some great blogs, I wanted to join in on the conversation. Last year Flower Mart was the official launch date of Local Color Flowers, it's hard to believe we've been in business for a year, but also hard to remember life without Locoflo. Today Ellen and I had a full day of Flower Mart preparation, welcoming Year Two. We calmly put all the pieces together that we had been thinking about for months. A new back drop for the tent, new pictures to show off, a dry run of tent set up, and arranging flowers. I sewed, cut art board, designed the "show" arrangements, and overall loved being in our shop creating with Ellen. Which is for me one of the most fun aspects of this venture, creating beautiful floral pieces. We are really excited about this weekend's festival. Come on out May 1st and 2nd to Flower Mart to see our work! LoCoFlo at the White House? After reading about Ms. Clarke's retirement, I started thinking-wouldn't it be cool if Local Color Flowers could get that gig? How would it work? Marina and I (and Eric and Bart and Finn) would have to move to Washington. We would plant a cutting garden on the south lawn, near the organic vegetable garden the First Lady planted last month. We would need a hoop house (that we could share with the veggie gardener if he wanted to extend his growing season) and a greenhouse to ensure we had locally grown flowers year round. We'd probably still have to buy from other growers, so we would pull in the growers that we use that service DC: Woolam Gardens, Farmhouse Flowers, Lynn Vale Studios and others. While Nancy Clarke did amazing work, it was mostly in a traditional style. Wouldn't it be fun to see arrangements with ornamental peppers and kale and artichokes and crazy curly willow and that crested celosia that looks like a brain. Wouldn't it be great if the First Family committed to using locally grown flowers in the White House? Wouldn't it mean the revolution was in full swing if two girls from Baltimore became the White House florists? After a busy weekend, Marina and I left out at the crack of dawn Monday morning headed to Gainsville Virginia for the Mid-Atlantic Regional Meeting of the Association of Specialty Cut Flower Growers We were going to spend the day on a farm hanging out with 80 or so flower growers from the Maryland, Delaware, Pennsylvania, New Jersey, West Virginia, Virginia and North Carolina including some of our favorites from Scarborough Farm and Woolam Gardens. While we aren't growers ourselves, except for a few odds and ends, we decided to become members of the ASCFG this year. Being a member is like getting an insiders look at the farms where we buy our flowers. We get to find out what's new with the growers , what they're growing, what they're struggling with and what they are most excited about. The meeting was held at Andrea Gagnon's beautiful farm located in Gainsville, Virginia. The farm has been in her husband's family for over 8 generations. She currently has about 2 1/2 acres under production in cut flowers. Andrea is funny, creative, quick to share mistakes she's made, and like most growers, always dreaming about what could be if there was less deer and more hired help. Besides growing for markets, Andrea also does special event work and hopes to create a destination farm for visitors to come share. In the field, Andrea showed off some beautiful lilacs that were blooming as well as tulips, lenten rose and a few alliums. In the greenhouse, there were ranunculus, anemones, delphinium and the most beautiful poppies in stunning oranges and yellows. The great thing about getting together with these growers is that they really like each other, they respect each other, they want to see each other succeed. They also enjoy ribbing on one another and occasionally cracking open a beer together. Because of this close knit relationship, they share ideas, techniques, failures and successes. Its really refreshing to be a part of a local industry with such great folks. As we were leaving, Marina was excited to meet two new growers: Joy and Scott Page from Freedom Flowers out in Buckeystown MD. Don't know much about them yet, but they're near Frederick and they grow some ornamental berries and seed pods that we don't always have access to. We're always trying to expand our group of growers especially ones with cool, unique, out of the ordinary offerings. Marina and I have been hard at work gearing up for a busy Spring. While our growers spent much of their winter pouring over seed catalogs and planting seeds, Marina and I were doing our own Spring preparation. First thing’s first: we have a BLOG! We've been talking about creating a blog for a while now, but we've finally got it up. We're hoping to fill the blog with stories, photos and other news about our work, our growers and our clients. We also wanted to share design ideas with you, connect you with the Buy Local campaign in Baltimore and get your ideas, comments and feedback. Marina and I will both be posting so make sure to check back often. In addition to the blog, we also have a new website (and a new logo!). We had a lot of help on this project. Thanks to everyone that gave feedback on our logo options, thanks to Young and Eric for working with us until the logo was exactly right and special thanks to Eric for designing and creating the new website. So now folks have lots of places to see our work online. However, seeing the real thing is even better. Spring in Balitmore is festival time. Local Color Flowers will be at Flowermart in Mt Vernon on May 1 and 2 from 11am-8pm. We’ll be located in the same spot we had last year on the east side of Charles just north of the monument. This year, in addition to having arrangements on display, we’ll have arrangements for sale on both Friday and Saturday . 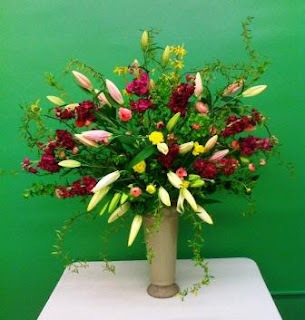 We’ll also be taking orders for Mother’s Day arrangements (which is May 10th this year. Don’t forget!) Come by and say hi! We’ll also be at Cylburn’s Market Day on May 9 from 8am-2pm. We will have Mother’s Day arrangements for sale and for those of you who ordered in advance, you’ll have the option of picking up your arrangements that day. As you can see, we're working hard to share our work with you in alot of different ways. (you can find us on Facebook too!) I hope you'll bookmark this blog and keep checking back. We’re only getting started so stay tuned.